This tracking device is cell based, so it is best for urban environments where cell phone reception is available. 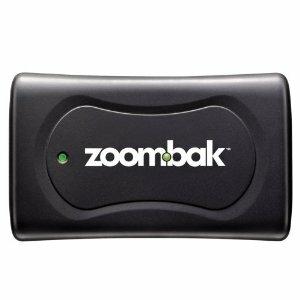 Like the PocketFinder and Tractive, with the Zoombak GPS tracking device, not only can you use it to track your pet, but you can also use it to track your children, your car, or any other property that moves outdoors. The Zoombak is a stand alone device that is not built into a dog collar, so it is portable and is easily transferred from one object to another. That means that you can place it in your car or in your child’s pocket for tracking. To use it to for your pet, simply place the device in the Zoombak pet pouch and attach the pouch to your dog’s collar. You can set up to 10 safety zones by logging into your account on the Zoombak web site. The safety zones can range from 110 to 880 yards, and can manually be activated and deactivated, or can activate and deactivate on a pre-set schedule. Let’s say you set up one of your safety zones to encompass your house and yard. Should your dog leave the zone, Zoombak will notify you via your choice of text and/or e-mail. You can use your cell phone to obtain the location of your dog and the device, access it’s location via the Zoombak web site, or get the information by calling Zoombak’s toll free customer service number. The tracking device weighs 2.5 ounces and the battery lasts for approximately 5 days before needing to be re-charged. You can receive optional alert notifications when your Zoombak battery is low or when the device is turned off. The device comes with a a 30-day risk free money back guarantee and a 1 year warranty. You can choose from a monthly, one year, or 2 year monitoring plan. Early termination fees apply. Portable and can also be used to track vehicles, children, etc.